The men’s basketball team beat Worcester Polytechnic Institute, who is ranked No. 2 in the New England Women’s and Men’s Athletic Conference, on Saturday after coming back in the second half from a setback of fourteen points. 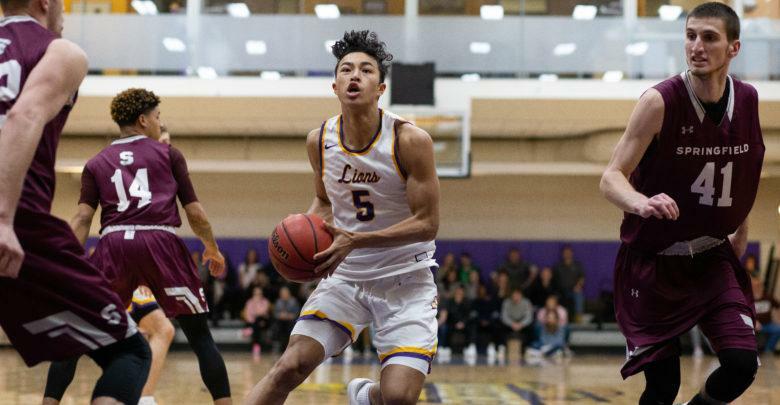 Freshman guard Nate Martin sank a late-game, three-point shot and had a crucial steal off an inbound to send the Lions into a 73-70 victory over WPI. The Lions are now tied for second place in the NEWMAC with WPI. WPI took a decisive lead in the first three minutes of the game, but the Lions tallied a point after freshman center Jarred Houston scored one of two of his free throws. The first half remained in favor of WPI until junior guard Jack O’Connor made one of his two free throws after being fouled to shift the momentum in favor of the Lions. With four minutes remaining in the first half, O’Connor hit a crucial three-point shot to lower WPI’s lead to 29-22. Senior guard Geoff Gray and freshman guard Zach Waterhouse powered through the paint to land key two-point shots, bringing the game to a three-point difference. Waterhouse then sank two long-range, three-point shots, and Gray made both of his free throws after being fouled in the paint to end the first half tied at 34-34. The Lions began the second half with the same intensity WPI had in the first half. Houston opened the scoring with a crucial two-point layup, and a steal from O’Connor led to an across-the-court pass to Gray for another easy layup. The second half went back and forth for the first eight minutes of play, but a strategic timeout by WPI broke the Lions’ momentum and allowed WPI to stretch the lead to fourteen. Emerson put the game back to a one-point differential with four minutes remaining, and back-and-forth baskets left the game tied at 70-70 with 50 seconds remaining. Both teams played defensively in hopes of keeping the other from scoring, but an off-balanced, three-point shot by freshman guard Nate Martin gave the Lions a 73-70 lead with two seconds remaining. Martin went on to seal the Lions’ victory by intercepting WPI’s final inbound attempt. In a post-game interview, head coach Bill Curley said he had a few words of wisdom for the team during halftime. Houston scored a team high of 20 points for the Lions and totaled six rebounds in 31 minutes of play. Curly said the team’s effort to get the ball to Houston in key moments boosted the team to storm back and beat WPI. Martin, who hit the game-winning three-point shot, totaled five points, three steals, and three rebounds in 28 minutes off the bench. The Lions play their final two regular-season conference games next week. They play at Babson College on Feb. 13 at 7 p.m. and at home against United States Coast Guard Academy for their senior day on Feb. 16 at 1 p.m.